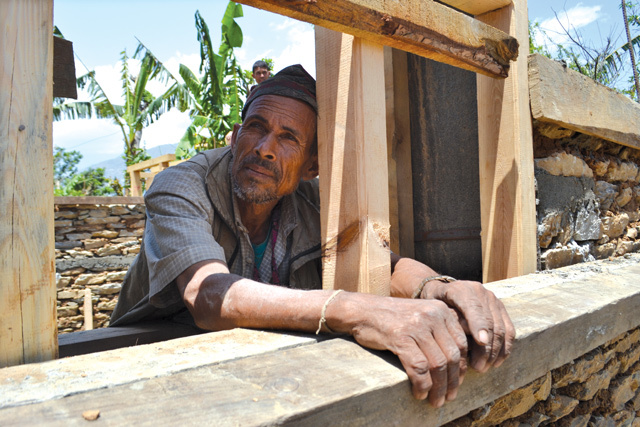 Khem Prasad Pathak has not rebuilt his earthquake-destroyed house yet. 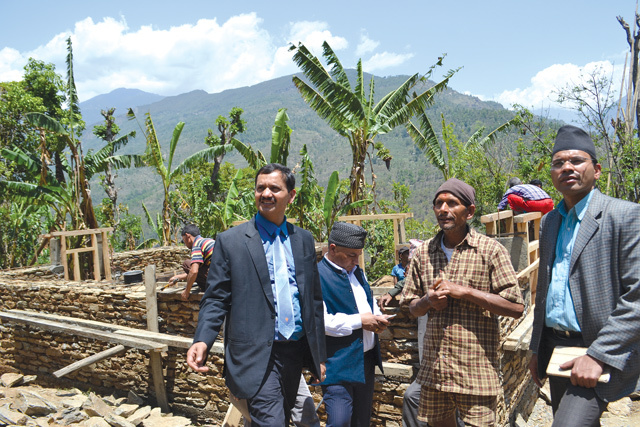 But he is helping construct the house of his neighbour Dil Bahadur Siwakoti (pictured with NRA CEO Govind Raj Pokharel,below). Pathak says he will probably rebuild his house next year after his son sends him money from Malaysia. On Tuesday, as Kathmandu got ready to mark the second anniversary of the 25 April earthquake, the man heading the reconstruction campaign was on a long and bumpy 7-hour jeep ride to a village in Dolakha. Just as the clock showed 11:56 AM Govind Raj Pokharel of the National Reconstruction Authority (NRA) was meeting Dil Bahadur Siwakoti, 55, who was busy building his house. Siwakoti scratched his head, looked at his home. “That we must build strong houses so we will be safe in the next earthquake,” he replied. “It is our responsibility to rebuild our own houses, not the government’s. 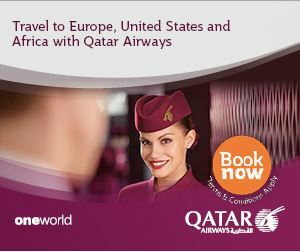 The government just gives us Rs 300,000 and some guidance, then it is up to us,” he said. This was obviously what Pokharel wanted to hear. The government and the NRA that he helped set up in 2015 have been strongly criticised for not doing enough to help rebuild the 600,000 homes that were destroyed in the earthquakes. And here was a chance encounter with a villager who was not waiting for government, but rebuilding himself. Back in Kathmandu, the international coverage of the anniversary was negative and on social media the NRA was facing blistering criticism, even ridicule. Amnesty International and the National Human rights Commission (NHRC) slammed the NRA for ‘violating the human rights of survivors’. Whatever Pokharel said was going to sound defensive, so he had driven out to the mountains, disregarding numerous invitations to anniversary functions, to see things for himself. Pokharel and his team spent 19 hours in the field on Tuesday, stopping along the road to meet villagers, talk to engineers, inspect newly-built houses and handing over second-installment cheques. Last weekreplac he had gone to Sindhupalchok with the Milijuli Nepali radio team (see page 6) to spend a night in a tent with survivors to get a first-hand account of the obstacles to reconstruction. Those who know Pokharel say that the German-trained engineer is a workaholic. He has not taken a day off since he was re-appointed as the NRA chief in January, reaching his office inside Singha Darbar at 7 am, eating a home-cooked lunch and often taking work back to his home late in the evenings. As a boy in Pyuthan, Pokharel decided to become an engineer after watching his mother get lung infections from cooking in a smoky kitchen wood stove. He studied hard, got a scholarship to do engineering first in India and then in Germany. After returning to Nepal, Pokharel first worked in a UNDP project in Myagdi and then headed the Alternative Energy Promotion Centre (AEPC) where colleagues credit him for pushing the goal of smoke-free stoves for all by 2017. 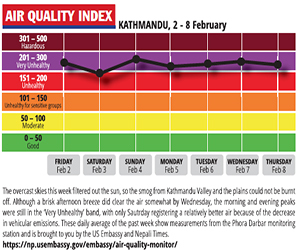 Although that goal has not been met, fuel-efficient smokeless fireplaces are now commonplace in rural Nepal. When the earthquake struck two years ago, Pokharel was Vice-chair of the National Planning Commission (NPC), appointed by the NC government to envision and lead an autonomous body to rebuild the earthquake-damaged Nepal. But he got to work only for two weeks, and was soon replaced by Sushil Gyewali when the UML government took over. Pokharel is a comeback kid. The Maoist government sacked him from the AEPC in 2008 to appoint their own man, but he returned to the Centre to continue where he had left off to promote renewable energy at a time of crippling electricity shortages. Similarly, he returned to the NRA after the government changed three months ago. Much of the delay in reconstruction and the ineffectiveness of the NRA is due to this political meddling in the NRA as the main parties compete for influence, and what they think would be control over vast sums of donor money for rebuilding. When he was re-appointed to the NRA it was expected that Pokharel would hit the ground running. But much to his own dismay, he has found that the agency he helped found is neither autonomous nor able to make its decisions on disbursement. Pokharel readily admits that reconstruction is delayed, doesn’t want to get into the blame game, but is focused to make up for lost time. It is not easy because he has to refer even the smallest decisions to the Cabinet, and all the money is controlled by the Ministry of Finance. Pokharel is mild-mannered, polite and has a pleasant demeanour. But he can be blunt and impatient sometimes, as when a radio reporter asked him for a sound bite on the NHRC’s report on delayed aid. “Some people only know how to criticse,” he said with a sharp edge in his voice. Pokharel’s first order of business has been to revise some NRA guidelines. Families who had not strictly followed quake-resistant house models and had therefore been refused the second installment of their reconstruction grants can now get it. “They still have to adhere to the design elements that strengthens the house, but we have decided to be flexible on dimensions and other small shortcuts,” Pokharel says. On the way back to Kathmandu, as the jeep lurched along the Jiri Highway, Pokharel received a call. The President of the National Association of Foreign Employment Agencies (NAFEA) wanted to discuss his proposal to mobilise outbound migrant workers in reconstruction. Pokharel is finally back in Kathmandu at midnight, and by 9AM is at the Radisson Hotel to attend a seminar on safe housing by the Japanese group, JICA. It has been a long road for Govind Pokharel from his mother’s kitchen in Pyuthan to Dolakha, with many twists and turns along the way. Mamata Thami (left) was studying in Grade 2 when the earthquake destroyed her Gurjapa Basic School in Lapilang village of Dolakha. If it hadn’t been a Saturday, she and her fellow students in the 10-classroom school would have been crushed. Since then, Mamata and her friends have been studying in a temporary tin hut, where she is now in Grade 4. 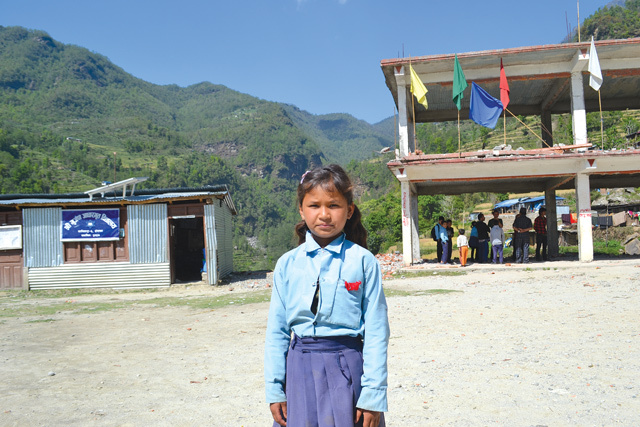 The 25 April earthquake and its 12 May aftershock destroyed as many as 366 schools in Dolakha. Two years on, only 17 of them have been rebuilt. Sagar Acharya of the NRA in Dolakha says 89 more schools will be completed in a year, and it will take three more years for all schools to be rebuilt. By that time, Mamata will have finished primary school and moved on. "We are committed to multiparty democracy, freedom of press and rule of law..."
In this interview with Prime Minister Pushpa Kamal Dahal printed in the Wednesday edition of the Finnish newsmagazine, Suomen Kuvalehti, Katri Merikallio asks him about his commitment to democracy, the free press and the future of the peace process.